I remember being told by the old time Ozark natives that having a buckeye in your pocket is good luck. Of course that meant I carried them around with me for a while. My mother probably got tired of finding buckeyes in the wash. 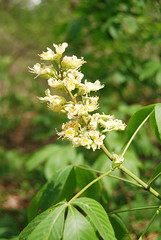 This entry was posted in Trees, Trees in Bloom and tagged Aesculus glabra, Buckeye, Flowering Tree, Ozarks, Piney Creek Wilderness, shrub, White, Yellow on April 9, 2012 by Ginger.